Last week the UN halls have been the battlefields of aggressive speeches by world leaders. My interest is in the speeches concerning the Middle East; a very dangerous and volatile area, whose unfolding battles are affecting the whole world. The warriors of these battles were American Donald Trump, Zionist Israeli Benjamin Netanyahu, Palestinian Mahmoud Abbas, Iranian Hassan Rouhani, and Syrian Walid Al-Moualem. One cannot but explode in laughing about these narcissistic false claims as the whole audience had done. The American people have not seen those $10 trillion, that were paid to military corporations, stock-market prices have been artificially raised, unemployment is record high with the majority of people living from one pay check to the next, homelessness has become epidemic, tax cuts went only to the wealthy, educational budgets were severely cut, medical coverage are not affordable by the millions, crime rates and police violence are on the rise, record military funding for perpetual wars and border walls are shame to brag about. Politicians excel in camouflaging their dubious behaviors into the exact opposite, and Trump is the master in this. History has proven that the choice of these pro-Zionst American administrations has always been perpetual wars, terrorism, intimidation, bullying, blackmail, control and dominance without any respect for the rights and well-being of other nations and not even for their own citizens. Recent administrations have felt emboldened even to confess that they create, finance and arm terrorist groups to wage American as well as Israeli proxy wars around the globe. Strong historical evidence prove that the US had toppled many democratically elected governments; e.g. 1953 Iranian democratically elected Mosaddeq’s regime, created al-Qaeda in Afghanistan, ISIS and al-Nusra in Syria, and waged proxy war against Yemen among many other documented examples around the globe. The American administrations have used, and are still using, financial resources and armies of other states such as Saudi Arabia, UAE, Qatar, Jordan, Egypt to wage its proxy wars against other states in the region. As NATO members are beginning to free themselves from the American warmongering whims Trump has assigned CIA director Mike Pompeo to work “with the Gulf Cooperation Council, Jordan, and Egypt to establish a regional strategic alliance so that Middle Eastern nations can advance prosperity, stability, and security across their home region.” This is actually an Arab NATO-like alliance similar to the 1990 anti-Iraq Gulf War Coalition, whose main function is to wage American/Israeli proxy wars in the region specifically against Iran. Trump demonized Iran’s leaders stating “Iran’s leaders sow chaos, death, and destruction, they do not respect their neighbors or borders or the sovereign rights of nation” Actually, Iran’s leaders sow respect, cooperation, security and humanity that gained them popularity and respect in the region. They fought American/Israel/Saudi terrorists, sheltered and secured refugees, and donated aid to disaster areas. He is, here, actually describing his own administration, Wall Street, Federal Reserve and banking system, and American mega corporations, who are perpetrating these crimes. 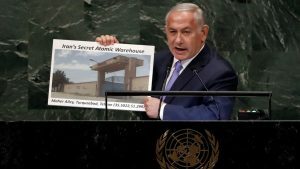 As soon as Israeli Netanyahu started his speech he immediately accused Iran of having a secret nuclear program, again using his silly drawings, “Disclosing for the first time that Iran has another nuclear facility, a secret warehouse for material for secret Iran’s nuclear program” where Iran is storing at least 15 gigantic ship containers full of 300 tons of nuclear equipment and materials hidden in nuclear compounds in “Turqusabad”. Iranians could not but explode in laughter when Netanyahu mentioned Turqusabad, because in their folklore stories Turqusabad is a non-existent fictional place. Yet this did not stop Netanyahu from urging IAEA to inspect this imaginary location. 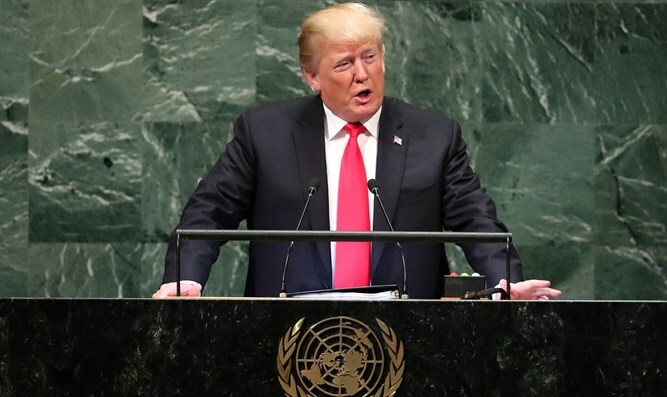 Using scare tactics, he warned UN members that “Iranian aggression will not be confined to the Middle East” citing alleged arrested Iranian agents plotting terror attacks in the US and in the heart of Europe. Netanyahu urged UN countries to stop cuddling Iran’s dictators and to join Trump’s sanctions against Iran because companies would abandon Iran and do business with US, whose GDP is 50 times the size of Iran’s GDP, Iran’s economy is destined to collapse, it’s currency is plummeting, inflation and unemployment are souring and most important when next patch of economic sanctions are imposed in November Iranian people will rally against the regime rather than around it, and will chant “death to the dictator rather than death to America”, and instead of chanting to export the Islamic revolution they will demand to leave Syria and Lebanon and Gaza and to take care of us. One cannot help but be amazed by Netanyahu’s wide unrealistic imagination and lying creativity. Maybe he thinks people are so stupid that he can outsmart them. Really, will the world learn lessons from Netanyahu’s perpetual lying episodes? Due to the myths of America’s manifest destiny, and god’s chosen people, both Trump’s administration and Israel seem to feel privileged and entitled to dictate their will, to violate international laws and conventions and to undermine international organization using bullying, intimidation and economic and financial sanctions. 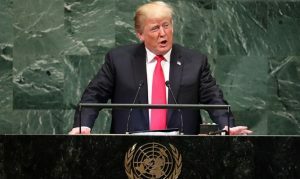 Trump’s administration has withdrawn from climate accord, from NAFTA, from Transpacific Partnership, from JCPOA in violation of UNSC resolution 2231, undermined World Trade Organization to impose unreasonable tariffs and sanctions on other countries, undermined and withdrew from UN Human Rights Council after Nikki Haley threatened to take names of its members, undermined International Criminal Court (ICC), pulled out of UNESCO, cut down US contribution to UN peacekeeping budget, and stopped funds to UNRWA. Israel has never implemented any related UN resolution since its illegal establishment. Since 1947 there have been 705 UN resolutions and 86 Security Council resolutions related to the Arab/Israeli conflict. Emboldened and supported by American policies and VETO power Israel has never implemented any of these resolutions. Israel has also violated all agreements and accords it signed with the Palestinians. While praising warmongering butchers king Salman and crown prince; Muhammad bin Salman (MBS), for their alleged bold new reforms, discarding their on-going genocide in Yemen, and celebrating Israel’s 70thanniversary and genocide of Palestinians as a thriving democracy in the Holy Land, Trump did not mention Palestine, but claimed that he took significant steps forward in the Middle East by acknowledging obvious facts and moving US embassy to Jerusalem. Palestinians for Trump are nobody to be concerned about. In itself, this is a confession that this international human rights organization has recognized that Israeli terror is the utmost danger. Emboldened by the unwavering but unethical American support Netanyahu diverted blame from Israel by accusing “… unreformed UNRWA; an organization instead of solving the Palestinian problem perpetuate it.” UNRWA is a humanitarian organization, whose job is to aid Palestinian refugees and not solving Palestinian political problem. Resorting to his distorted religious beliefs (the opium of the people), and ignoring the existence of the indigenous owners of Palestine, he told the mythical story of Abraham, Sara and other Judaic figures, who immigrated to Palestine and signed an eternal covenant with god; a contract with a racist real estate broker, who choses one small group of people over the billions of other people and promises them a piece of land. He concluded his speech with the historical distortion and his disillusioned poetic assertion that Palestine is the land “from which we were exiled and to which we return, rebuilding our ancient and eternal capital Jerusalem. The nation state of Israel is the only place where Jewish people proudly can exercise our collective right of self-determination” – on the expense of indigenous Palestinians. 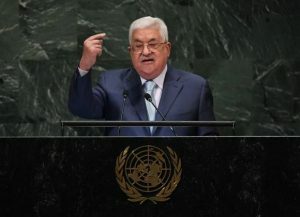 Mahmoud Abbas’ speech came as a whimpering sick dog begging for help rather than demanding justice. In between sick coughing and throat clearing he complained about Israeli violation of all agreements and accords, and of not implementing even one of the many UN resolutions. He criticized Israel’s nation law describing it an apartheid law. He complained about Israeli oppressive measures against Palestinians and desecration of Palestinian holy places. He complained about Israel’s intention of demolishing the village of Khan El-Ahmar to divide the Palestinian territories into two halves. He rejected Trump’s unjust actions of recognizing Jerusalem as Israel’s capital and moving the American embassy there. He also complained that Trump had cut funds to the PA, to Palestinian hospitals in Jerusalem, of cutting funds to the UNRWA, and of closing the Palestinian office in Washington. He expressed his disappointment of Trump’s administration and asked Trump to retract all these measures. Abbas considered the US to have become biased in favor of Israel rather than an honest broker of the peace process, and asked other nations including the Quartet to become brokers for peace instead. He objected to the fact that although the PLO is considered and is recognized by the UN as the only representative of the Palestinian people the American Congress still considers it a terrorist organization. He reiterated PA’s commitment to peace, readiness as always to sit at the negotiating table with Israel, renouncing violence and armed resistance but following what he called peaceful popular resistance vis a vie the armed settlers’ aggression. Then he asked what else do you want us to do after we had already given up almost everything. He confessed that the PA is not able to protect itself nor its Palestinian people and blamed the UN for not protecting Palestinians after they promised to do so. He also requested UN members, who did not recognize Palestinian state to join those who did and recognize the Palestinian state. Although the UN is not the correct place to do this, Abbas claimed that he is exerting every effort for reconciliation with Hamas in Gaza to re-unite Palestinians, yet he threatened Hamas that he will not take any responsibility if they refused his conditions. Hamas was the democratically elected government in 2007 as certified by international observers. 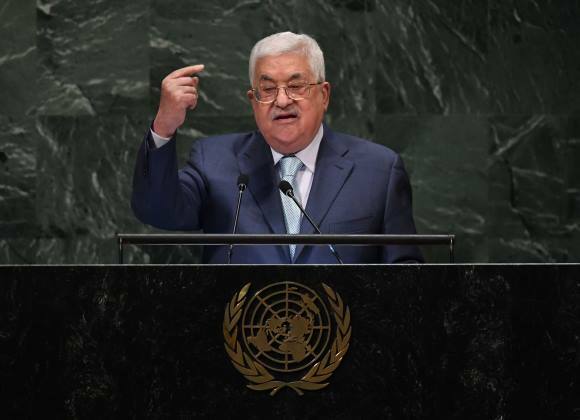 Abbas, whose term expired in 2007, has been a huge disappointment to Palestinians. Instead of protecting his people, he, and his so-called security forces, has functioned as Israeli proxy police force protecting Israelis and oppressing his people. He instructed his security forces to arrest hundreds of Palestinian activists the night before his speech. He considered the US decision to transfer its embassy in Israel to Jerusalem and the Israeli enactment of the racist Jewish state law as flagrant violations of international law and clear manifestation of apartheid. “Israel equipped with nuclear arsenal and blatantly threaten others with nuclear annihilation presents the most daunting threat to regional and global peace and stability” he emphasized. Both Rouhani and Al-Moualem criticized US administration for its withdrawal from the JPCOA in violation of UNSC 2231and imposing sanctions although IAEA had issued 12 reports indicating that Iran is compliant with the agreement. They considered these sanctions as economic war and warned that US bullying other nations to violate and undermining international laws and conventions will endanger world peace and security. “The US understanding of international relations is authoritarian. In its estimation might is right. Its understanding of power not of legal legitimate authority is reflected in bullying and in imposition. No nation can be brought to negotiating table by force” accused Rouhani. Rouhani explained that Iran is against nuclear weapons yet for nuclear knowledge. Similar to the US and other countries Iran has the right to develop defensive weapons, such as ballistic missiles that have been used only twice against terrorist groups; ISIS, who attacked the Iranian Parliament and a number of cities in the Iranian Kurdish region. In the Syrian crisis Rouhani explained that Iran had warned against any foreign intervention in the internal affairs of Syria, and that the crisis can only be resolved thorough intra-Syrian dialogue. He explained that the presence of Iranian military advisers in Syria has been at the request of the Syrian government, and consistent with the international law, and aimed at assisting the Syrian government in combating terrorists. Through the Astana Process Iran had helped preventing escalation in blood shed in Idlib region. 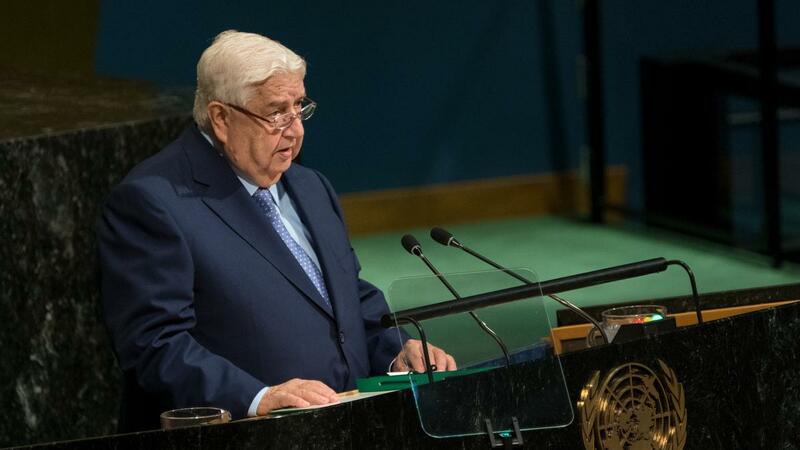 Syrian Deputy Prime minister Al-Moualem explained that the battle in Syria could be a lesson to other countries because it is the battle of ideologies, a struggle between two global camps; one promotes peace while the other promotes terrorism and hegemony. He accused the US of leading an illegitimate international coalition to destroy Syria under the pretext of combating terrorism, while they are providing military support to the terrorists. He accused the US of releasing terrorists from Guantanamo prison and sending them to Syria where they became leaders of al-Nusra and other terrorist groups. He explained that US forces present in the Tanaf area in south Syria had created a safe haven for ISIS terrorists, who perpetrated suicide attacks against the governate of Suwayda. Al-Moualem warned that “Any foreign presence on Syrian territories without the consent of Syrian government is illegal and constitutes a flagrant violation of international law and the UN charter. It is an assault on our sovereign nationality” considering US, French and Turkish forces operating on Syrian territories without explicit request from Syrian government as occupying forces and threatening to deal with them as such. He advised that these forces must immediately withdraw without any conditions. He also explained that Israel, too, has been supporting and protecting terrorist groups attacking Syria. He further stated that Israel continues to occupy Syrian Golan and aggressively oppress Syrian citizens there. He demanded the international community to compel Israel to implement UN resolution 497 on the occupied Golan and expressing his government determination to liberate the Golan to the lines of June 4th 1967 the same way they liberated southern Syria from terrorists. He defended Syria against accusation of chemical weapons use by reiterating that Syria rejects the use of chemical weapons and reminding that Syria had completely eliminated all its chemical weapons as confirmed by international organizations, and had always cooperated with Organization for the Prohibition of Chemical Weapons (OPCW) to investigate all alleged accusations. He condemned the tripartite aggression perpetrated by US, France and UK against Syria last April claiming that chemical weapons were used without any investigation or evidence, and in flagrant violation of Syrian sovereignty, the international law and the UN charter. He accused the White Helmet group, created by British intelligence, as a terrorist organization, who orchestrated and fabricated accusations of chemical weapons attacks. Al-Moualem concluded his speech expressing solidarity with Palestinians against Israeli occupation and American late illegal measures, solidarity with Venezuela in the face of American interference in its internal affairs, and a call for lifting all unilateral economic sanctions imposed on all countries including Syria, Iran, DPRK, Cuba and Belarus.